Welcome to the 2018 "The Legend of Zelda" Any% (no up+a) 1st quest tournament! ANY AND ALL ARE WELCOME! If you are new to vanilla Z1, or just need a few pointers, please check out http://redcandle.us/The_Legend_of_Zelda or https://www.sites.google.com/site/zeldaanypercents/ . 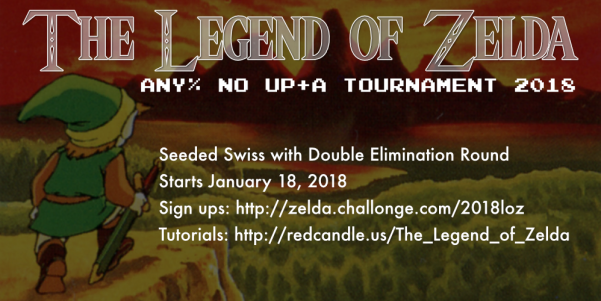 (TL, DR) This tournament began with a 5-round Seeded Swiss stage, followed by a bracket made up of the top 24 runners in Swiss. The 1st round was seeded in a snake format. Seeds from then on were determined based on record, using times as a tiebreaker. The bracket stage was double-elimination, with the final four of both winners' and loser's brackets being a best-of-three. The Grand Finals reset and was a best-of-five, with a 1-0 lead for LackAttack24 since he won the Winner's Bracket. Signups went live December 17, 2017, and ended January 18, 2018. Tournament started January 18, 2018.